Indiana Poodle Rescue View other Poodles for adoption. 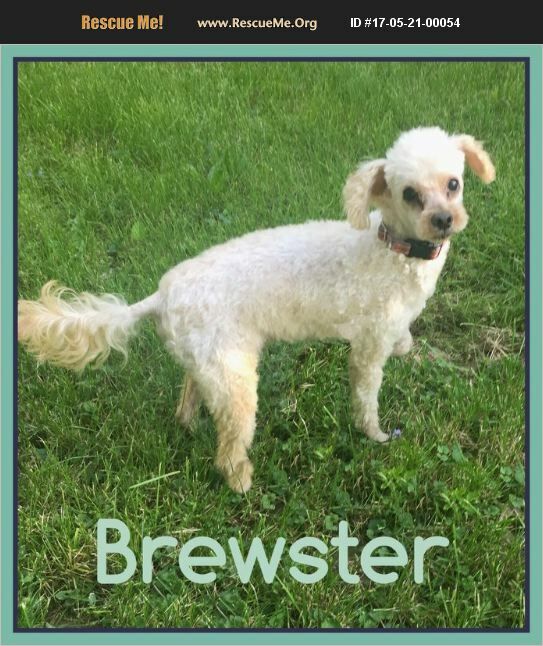 Brewster is a sweet, 6-7 yr old, 10lb poodle/pom that came to the rescue last year with 2 others after being surrendered to a shelter. They were obviously abused and neglected. Their legs were matted together, they were terrified of being touched and an X-ray showed that Brewster had a BB lodged under his skin. We worked with them over the winter and spring and happily the other 2, who were bonded, were adopted together last month. At first we though Brewster would not do well with other dogs but after a dental to removed some bad teeth and the BB from his back, Brewster is now a happy boy who does well with big and small dogs and would love at least one canine companion in his new home. He still is a bit shy around new people but will warm up quickly. He is house-trained and will sleep in a crate or crawl up on your bed. He recently has a grooming and did great with the groomer. He is neutered, up-to-date on vaccinations, microchipped & heartworm/lyme disease negative. His adoption fee is $200. Please email for an application. souldogrr@gmail.com.